I'm a daughter, wife, mom, grandma and friend. 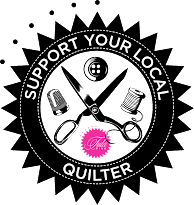 I love every kind of quilting and I'm a longarm quilter who likes to share her interests. I'd like to be your quilter. As you know, I'm not the greatest at updating, but you can see my work over there. Come on over, visit and comment! I'd love to see you there. Just wanted to share some pretty flower pics. These are the lilies in my front garden. Here it is, Wednesday. I've been working on my center block for Love Entwined. I've finished the paper piecing. The flash washed out some of the color, but you can get the general idea. I'm trying to decide on a color for the center star. Other than that, I've been working on a memory quilt for a customer. Can't show that yet, too many pieces. I'm linking up with Esther's blog, please head over there to see what everyone's working on. It's funny, you know. You start to do something, like a blog, and you're gung ho. Then life interferes, times change, and the blog falls by the wayside. I'm going to try again. I've got a reason. I'm taking part in an 18 month block of the month. Her quilt is totally out of this world! It's called Love Entwined, a 1790 Marriage Coverlet. It's part applique and part piecing. Here's her blog: http://estheraliu.blogspot.com.au/. Go check it out. Here's a pic of the quilt. Isn't it fantastic? Right now, I'm planning on making the whole thing from my stash. I finished this quilt yesterday. The client wanted traditional feathered wreaths, so that's what I did for her. I've been working a lot, but I forget to take pictures. I'll try to do better. I took this pic yesterday from my studio window. DH Mike was weeding his "salad" garden. Won't be long now until we have some really good eats. This is a Four Patch Posy quilt; it's sort of a garden, isn't it? It was the first time she'd used a longarmer. Talk about performance anxiety! I think I did it justice, don't you? Here's a closeup of the block motif and sashings. I reversed the direction of the feathers in each one. And this is the back. I did the whole quilt in dyed natural thread, except for the inner cable border, which I did in a Victorian pink. That's it until next time. Now that the heat has broken, I'm hoping to be a little more productive. Stay cool, wherever you happen to be. 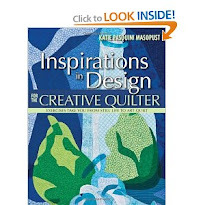 My quilt is in this book!